Here's something that's happened to me more than once in the past couple of years and that some of you may also have experienced in some form or other. The nature of my job, the one that pays the bills rather than the one that dominates my spare time and keeps this site ticking over, involves a variety of duties and a wildly uneven workflow. Not so long ago there was an explosion of activity that had all three of the staff in my section running from place to place for a good part of the day to sort out problems caused by equipment, locations and the blatant idiocy of others in a manner that, when it finally ceased, left us all gasping for breath. In true English fashion we put the kettle on and made tea and sat down to quickly drink it before the second wave begun. At that very moment an individual of frankly questionable seniority walked into the room and said, half-seriously, "Oh, so this is what you do all day." How I restrained myself from decking him is frankly beyond me. It's this very type of managerial misreading of briefly observed and incomplete evidence that is central to the fate of the ageing hotel doorman at the centre of F.W. Murnau's utterly gorgeous Der letzte Mann, known more widely in US and UK as The Last Laugh (the actual translation is The Last Man – the title change in the US was to avoid confusion with a film of that title already in circulation). 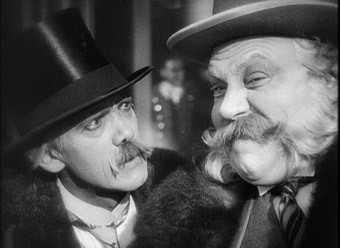 The unnamed Doorman, played with heart-tugging pathos by Emil Jannings, works for a prestigious hotel and is proud of his position and the uniform that goes with it, both of which are status symbols in the poor neighbourhood in which he lives. On one particularly busy and rain-drenched night he is unable to locate a porter to help bring a large and heavy trunk into the hotel and so undertakes the task himself. Momentarily exhausted, he sits on the trunk to get his breath back and take a sip of water. Just as he does so, the hotel manager walks into the lobby to bid two customers farewell and, bemused at the doorman's absence from his post, turns and completely misinterprets what he sees. A note is made in a pocketbook and a man's fate is unfairly sealed. Unaware even of the manager's fleeting presence, the Doorman returns enthusiastically to his duties. Astonishingly, this is the opening scene. Even today you would expect a good fifteen to twenty minutes of character-audience bonding for the event to have the expected impact, but Murnau is having none of it. Our emotional connection with the Doorman takes place as we follow him home, aware that a Damoclesian blade of as-yet undetermined shape is hovering over his head. The following day he arrives at work to find a younger man in the position that should rightfully still be his. Called to the manager's office, he is handed a letter detailing the action to be taken against him (in one of the many small but oh-so-right details, the manager makes a point of folding the note in front of the doorman before handing it to him, a completely unnecessary but typically officious act). Due to his years of service, the Doorman is not fired but demoted to the lowly position of washroom attendant, whose uniform is without glamour and whose status is far more obviously one of servitude. It quickly becomes clear that dismissal would have been a lesser cruelty than the abject humiliation this new position subjects him to. 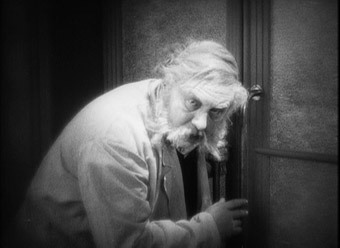 In their commentary on Masters of Cinema's DVD of Tabu, R. Dixon Smith and Brad Stevens made an ultimately convincing argument for Murnau's use of descent as a recurring motif and that's also clearly evident here, specifically in the basement location of the washroom and the deterioration of the Doorman's stance within it – in a crucial scene he is first observed standing, then sitting to eat, and finally on his knees cleaning the floor beneath the washbasins. For the Doorman this is not just an issue of position and income, but of his standing with his family and the local community. His determination to attend his niece's wedding the following day prompts him to steal his old uniform to wear at the celebration rather than admit to his shame, leading to an evening of revelry that temporarily wipes his memory of his misfortune. His approach to the hotel the following day thus delivers a considerable jolt, but his humiliation is not yet complete. Later that day his doting housekeeper decides to bring him lunch to his workplace and in doing so discovers the truth, or at least her version of it. In no time at all the word has spread throughout his apartment block that he is not what he has been claiming to be, and the locals are soon lining up to express their contempt. A socio-political reading is inevitable and clearly intended, but Murnau is taking no sides – rich and poor are ultimately shown to be equally unsympathetic, two sides of the same coin of judgemental snobbery. The considerable humanity at this story's core is reserved almost exclusively for the central character, a caring and conscientious man who falls victim to his own pride and the cruel prejudices of others. If you visit the site regularly you'll be aware of the extremely high regard in which I hold the work of Frederick Wilhelm Murnau, and it's with good reason that I'm not alone in this opinion. Murnau was a master of purely visual storytelling whose understanding of the emotive possibilities of camera placement and movement, coupled with the power of editing, was decades ahead of his time. That's an easy statement to make, of course, but you'll find justification aplenty here. Der letzte Mann was made back in 1924, and yet you'll find within its frames an exquisitely timed tracking shot that employs a dissolve to pass through a window frame in a manner later employed by Orson Welles in Citizen Kane; a rapid track out from a trumpet horn that fans of Sam Raimi's Crimewave will instantly recognise; a range of point-of-view visualisations of the sensation of being drunk and the experience of suffering a hangover; and a track back through the hotel restaurant picking up on people as they pass that could be straight out of Scorsese. 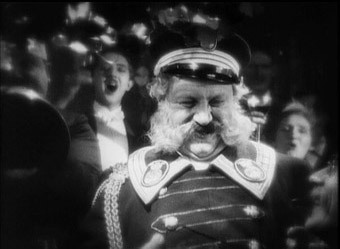 Nor are the camera movements restricted to mobile mountings – Der letzte Mann must be one of the first dramatic features to incorporate hand-held camerawork (well, strapped-to-the-chest camerawork, but the effect is the same) to involve the viewer as a participant in the action rather than the traditional position of observer. And this is just a sampling. None of the techniques employed here are superfluous or decorative. Working with master cinematographer (and later director) Karl Freund, Murnau uses every shot, every camera movement, every photographic trick to advance the narrative and intensify the emotional connection with his central character. With no intra-titles to clarify dialogue, the story is told not just through what people do but in the manner in which their actions are captured on film. Thus the camera flies from the trumpet horn not as an attention-grabbing scene setter, but to represent a sound we cannot hear as it travels across a courtyard, a technique that is later reversed when gossip of the Doorman's fate is carried to the ear of an eager neighbour. The dizzying post-party image distortions, meanwhile, serve to make the Doorman's experience a completely subjective one, cementing our relationship with him and his inglorious fate. Murnau saves his most audacious move for the final scene, which it would be a bit unfair to reveal here. Those familiar with the film will doubtless know what I'm referring to, an in-film admission that we are watching a story with an author who is able to control the fate of his characters, one that in more recent years would have been instantly labeled post-modern. It's one of many, many remarkable elements – in storytelling technique, in character detail and in technical handling – that make this essentially simple and intimate story one of the most thrilling film works of the silent era. It's getting to the point where I only really need to say the words Murnau-Stiftung and leave it at that to suggest just how good a silent film restoration looks. As with previous Masters of Cinema releases sourced from the German company, the restoration and transfer on Der letzte Mann are both superb given the film's age. There is still some damage visible, but too little to care about given the solid picture stability, excellent contrast and high level of detail on show here. I'd risk suggesting that the film has not looked this good since it was first projected in cinemas. The splendid orchestral score by Giuseppe Becce is in Dolby 2.0 stereo and sounds fine. I am presuming that the music was recorded specifically for this release, as the clarity and range are first rate. Another of the hugely informative documentaries made by Luciano Berriatúa for F.W. Murnau-Stiftung, this one covers the production, release and restoration of the film and includes an interview with Helene Luckow, daughter of the film's art director Robert Herlth. As ever this is fascinating stuff, not least the considerable detail provided on the different versions of the film produced for home and foreign markets and the difficulty of identifying exactly what constituted the original German version, which is the one presented here. One of MoC's slimmer booklets, this is still a fine read, containing a 2008 essay by R. Dixon-Smith, a 1974 piece by Tony Rayns, art director Robert Herlth's recollections of working on the film, and a 1927 article by Murnau himself entitled The Ideal Picture Needs No Titles. If you love cinema then the works of F.W. Murnau should be required viewing, and if you've never seen Der letzte Mann then do yourself a huge favour and track it down. Those who know and hopefully already love the film can rejoice at the splendid condition it has been restored to by Murnau-Stiftung, and at Masters of Cinema for adding it to the already impressive list of titles. A wonderful film on a fine DVD that comes unreservedly recommended.